For 60 seasons, the Minneapolis Millers made their home at a place described by former Minneapolis Tribune writer Dave Mona as soggy, foul, rotten, and thoroughly wonderful Nicollet Park. One of the most revered of minor-league ballparks, Nicollet Park, in its first season as well as its last, was home to a pennant winner. Prior to Nicollet Park, the Millers had been playing at Athletic Park in downtown Minneapolis since 1889. In May of 1896, however, the Millers were given 30 days notice to find a new home. The property at First Avenue North and Sixth Street, which included Athletic Park, had been sold and the Millers were evicted. The final game at Athletic Park was played May 23. The Millers then left on an eastern road trip, not knowing where their new home would be when they returned to the city. Four sites were under consideration, with a location along Kenwood Boulevard, across Hennepin Avenue from Loring Park, being considered the favorite; the city council, however, refused to vacate certain streets in the Kenwood area, and in late May, after the streetcar company announced it could better service a park near Lake Street, a decision was made to locate the field at 31st Street and Nicollet Avenue, within a block bounded on the north by Lake Street. The ground was quickly graded, bleachers, grandstands and fences hastily erected, and within three weeks the field was ready for baseball. All that remained for the wooden structure was a name. Three Minneapolis newspapers invited readers to submit suggestions; from that list a panel of writers selected the name Wright Field, in honor of Harry Wright, one of the games founding fathers. The new moniker did not receive a warm reception from the Millers owners, though, and for the next year the stadium was referred to in the papers as the new ball park. It wasnt until 1897 that the name Nicollet Park was first used. Whatever the name, the new grounds opened Friday, June 19, 1896 (on the 50th anniversary of what is regarded as the first official baseball game ever playedat Elysian Field in Hoboken, New Jersey). The Millers opened the park with a come-from-behind, 13-6 win over the Milwaukee Brewers. Varney Anderson held the Brewers to eight hits while Charley Frank hit the games only home runa two-run shot over the right-field fence in the sixth inning. In their new home, the Millers went on to win their first Western League pennant in 1896. 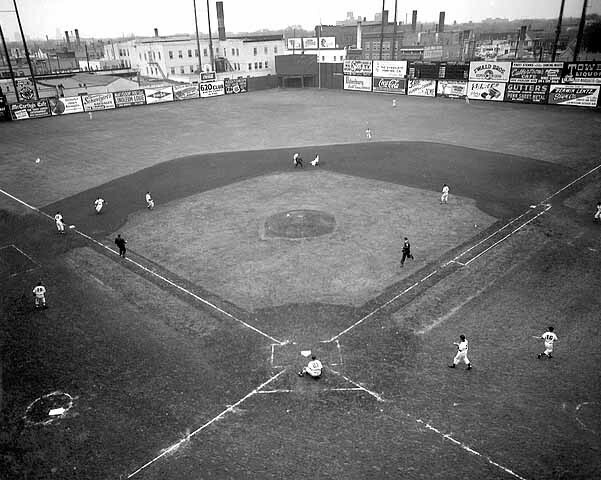 Nicollet Park remained the home for Minneapolis teams in the Western League, American League, Western Association, American Association, and Northern League through 1955. Earned runsMinneapolis 5, Milwaukee 1. SLally, Wilmot. HRFrank. SBConnors, Lally 2, Kuehne, Anderson. DPHartman-Taylor-Twitchell. BB-By Clausen 4. SOBy Clausen 4, by Anderson 1. HBP-By Anderson (Weaver). First base on errorsMinneapolis 8, Milwaukee 4. TimeTwo hours. A3,500. Two-base hitsBurke, Vaughn, Crooks. Home runsCarney. Double playLetcher to Vaughn. Base on ballsBy Killen 2. Hit by pitcherBurke 2. Struck outBy Killen 4, by Easton 7. Wild pitchesEaston 1. Passed ballsDowse 2. Time of game1:35. UmpireMcLaughlin. Although the playing area at Nicollet Park seemed spacious when in opened in 1896especially in contrast to tiny Athletic Park, where the Minneapolis Millers had moved fromsoon enough the ballpark at the corner of 31st Street and Nicollet Avenue acquired its own reputation as a bandbox. Sluggers, particularly left-handed swingers, took advantage of the short distance, only 279 feet, down the right-field line. In 1933, the Millers Joe Hauser set a professional single-season record with 69 home runs, 50 of them hit at Nicollet Park. In 1955, the final season for Nicollet Park, the Millers set a league record by hitting 241 home runs in addition to winning the regular-season American Association pennant. In the Association playoffs, the Millers finished off both the Denver Bears and Omaha Cardinals in four-game sweeps to advance to the Junior World Series, against the Rochester Red Wings. The Red Wings and Millers split the first six games of the series, bringing it all down to the seventh game, in what would also be the end for Nicollet Park. While the Millers had relied on a potent offense throughout the year, they were just as dependent on their ace pitcher, Al Worthington, who had won 19 games during the regular season. He was even more valuable in the playoffs. Worthington had appeared in 10 of the Millers first 14 playoff games, winning five without a loss. He had been the winning pitcher in relief the night before the finale and had a 3-0 win-loss record in the Junior Series up to that point. Minneapolis manager Bill Rigney made it clear he wouldnt hesitate to call on Worthington in the seventh game if he needed relief help. Even though he was well rested, Byerly didnt last long. The first batter of the game, Howie Phillips of the Red Wings, connected on a 2-1 pitch for a home run, a fitting start to Nicollet Parks final game. Singles by Jackie Brandt and Allie Clark, sandwiched around a ground out by Joe Cunningham, produced another run. An error and hit batsman helped Rochester load the bases with two out and force Byerly from the mound. He had lasted only 2/3 of an inning before giving way to Floyd Melliere, who retired Ebba St. Claire on a grounder to end the threat and then quieted the Red Wings in the ensuing innings. However, Rochester had a 2-0 lead that they held through the early innings behind the pitching of Cot Deal, who had already won two games in the series. Deal retired the first two batters in the fourth before Monte Irvin beat out an infield single and went to third on a double by Rance Pless. Bob Lennon, who had tied with George Wilson for the team lead with 31 home runs during the regular season, sent an 0-2 fastball over the fence in right to put the Millers ahead, 3-2. Carl Sawatski followed Lennons blast with one of his own, a line-drive home run to make the score 4-2. Irvin increased the lead to 5-2 with a long home run in the sixth. The Red Wings finally got to Melliere in the seventh, scoring two runs on a walk, double, and throwing error. With the Millers lead cut to a run, Rigney waited no longer. He signaled to the bullpen for a weary Worthington, who trudged in and closed out the inning. The Millers gave Worthington a cushion with four runs in the last of the seventhtwo on a home run by Don Bollweg, the last ever hit at Nicollet, and the final two on a double by Lennon. Worthington retired the Red Wings in order in the eighth and struck out the first two batters in the ninth before giving up a pair of singles. The next batter was Jackie Brandt, who tried to keep the rally going by bunting for a base hit on Worthingtons first pitch. However, Worthington charged off the mound, pounced on the bunt, and threw Brandt out to end the game, the Junior World Series, and Nicollet Park. a-Singled for Wooldridge in the ninth. LOBRochester 7, Minneapolis 6. 2BPless 2, Phillips, Lennon. HRPhillips, Lennon, Sawatski, Irvin, Bollweg. SOrtiz. HBPBy Byerly (Jok). UGuzzetta (IL), Crawford (AA), Linsalata (IL), Taylor (AA). T2:20. A9,927. RochesterHowie Phillips hit a 2-1 pitch over the right-field fence for a home run. Jackie Brandt singled to left and took second on Joe Cunninghams ground out to Bollweg. Allie Clarks single to left scored Brandt. Vern Benson reached base on Bollwegs error as Clark stopped at second. The runners held as Jay Van Noy flied to Lennon. Stan Jok was hit by a pitch to load the bases. Floyd Melliere relieved Bud Byerly and retired Ebba St. Claire on a grounder to Ortiz. MinneapolisLou Ortiz grounded to Phillips. Don Bollweg singled to right and went to second when George Wilson grounded out to Cunningham. Monte Irvin struck out. RochesterCot Deal tapped back to Melliere. Phillips flied to center. Brandt grounded to Ortiz. MinneapolisRance Pless flied to Brandt. Bob Lennon flied to Clark. Carl Sawatski flied to Brandt. RochesterCunningham flied to Lennon. Clark singled to right but was thrown out, Wilson to Bressoud, trying for a double. Benson grounded to Bollweg, Melliere covering. MinneapolisTom Burgess went into play right field and Van Noy moved to left. Ed Bressoud grounded to Benson. Melliere and Ortiz grounded to Jok. RochesterVan Noy grounded to Bollweg, Melliere covering. Jok grounded to Melliere. St. Claire walked. Deal flied to center. MinneapolisBollweg grounded to Cunningham, Deal covering. Wilson grounded to Phillips. Irvin beat out an infield hit down the third-base line and stopped at third on Plesss double to left. Lennon hit a high 0-2 fast ball over the right-field fence to give Minneapolis a 3-2 lead. Sawatski followed with a line-drive into the right-field screen to make it 4-2. Bressoud struck out. RochesterPhillips grounded to Pless. Brandt fanned. Cunningham grounded to Bollweg, Melliere covering. MinneapolisMelliere struck out. Ortiz flied to Van Noy. Bollweg popped to Cunningham. RochesterBurgess flied to Irvin. Benson popped to Ortiz. Van Noy flied to Lennon. RochesterJok walked. St. Claire flied to Wilson. Deal grounded to Melliere as Jok moved to second. Phillips doubled to left, scoring Jok; Irvins throw to second found the bag uncovered as Phillips took third on the throw and scored when Bollweg finally cornered the ball and then threw wildly to third. Al Worthington relieved and gave up a single to left to Brandt. Cunningham tapped back to Worthington. MinneapolisDuke Markell took the mound in place of Deal. Worthington beat out an infield hit to third. Ortiz sacrificed, St. Claire to Phillips. Bollweg homered to right on a 3-2 pitch. Wilson walked. Irvin popped to Phillips. Pless doubled to left, Wilson stopping at third. Floyd Wooldridge relieved Markell. Lennon doubled to right to bring home Wilson and Pless. Sawatski walked. Bressoud struck out. RochesterBurgess struck out. Benson flied to Lennon. Van Noy grounded to Bollweg, Worthington covering. MinneapolisWorthington flied to Brandt. Ortiz grounded to Phillips. Bollweg singled to right. Wilson flied to Van Noy. RochesterJok and St. Claire struck out. Charlie White batted for Wooldridge and singled to left. Phillips moved White to second with a single to center. Worthington fielded Brandts bunt and threw him out at first to end the game. Nicollet Park: A Colorful Page in Baseball History by Dave Mona, Minneapolis Tribune, November 6, 1966. AlphaWright Field, Minneapolis Tribune, June 17, 1896; A Glorious Tale: Minneapolis Opens the New Park with a Victory, Minneapolis Tribune, June 20, 1896, p. 7; They Tempted Fate: Millers Toy with the Friday and Thirteen Superstitions, Minneapolis Journal, June 20, 1896, p. 12. OmegaTom Brieres scorebook. Correspondence with Al Worthington, March 1984. Conversation with Tom Briere, 1998. Interview with Bud Byerly, January 23, 2004. September 29, 1955 Minneapolis Tribune: Millers Win Junior World Series Title: 9,927 See Last Game at Nicollet Park by Leonard Inskip, p. 1; Miller Home Runs Produce 9-4 Win, First Junior Crown by Tom Briere, p. S1. September 29, 1955 Minneapolis Star: Melliere Was Real Hero of Millers Final Victory by Bob Beebe, Nicollets Finest Year Season of Comebacks by Halsey Hall, and Old Nicollet Goes Out with Perfect Finish by Charles Johnson, p. 40; Nicollets Last and Finest Hour, p. 60.